Growing up in California during the depression isn't easy for eleven-year-old Rinko. She desperately wants to fit in and be like everyone else, but instead she is ridiculed and made to feel different because she is Japanese. But when Aunt Waka comes to visit, and brings with her the old-fashioned wisdom of Japan, she teaches Rinko the importance of her Japanese heritage, and the value of her own strengths and dreams, in this warm and touching story. Growing up in California during the depression isn't easy for eleven-year-old Rinko. She desperately wants to fit in and be like everyone else, but instead she is ridiculed and made to feel different because she is Japanese. 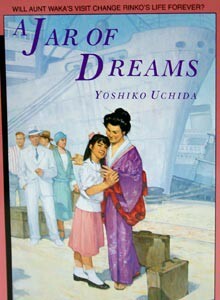 But when Aunt Waka comes to visit, and brings with her the old-fashioned wisdom of Japan, she teaches Rinko the importance of her Japanese heritage, and the value of her own strengths and dreams, in this warm and touching story.